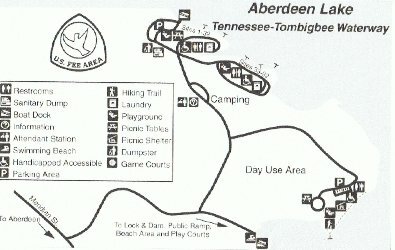 Blue Bluff Campground is located on Aberdeen Lake which is part of the Tennessee Tombigbee Waterway. It is an awesome scenic part of Aberdeen, in Mississippi. The area is named for the beautiful clay and limestone cliffs that border the park on the Eastern side. The bluff rises 80 feet above the water and the Aberdeen Lock and Dam is located right next door if you are interested in watching barges and other recreational boats go through the lock on the Tennessee-Tombigbee Waterway. This campground is a Class A facility with 92 sites. So, Where Is The Blue Bluff Campground? You will find this exquisite campground, located in North East Mississippi, midway between Tupelo and Columbus on US Hwy 45. Hwys. 25 and 8 also serve Aberdeen. Commerce and Meridian Streets intersect in the middle of town. From Commerce Street turn North on Meridian and continue until you cross a bridge. Take the first right onto Lock and Dam Road. Turn left on Blue Bluff Road into the campground entrance. You are really not far from a busy town. It is about 5 minutes from the site area. There are plenty of convenience stores, grocery stores, hardware stores, restaurants, a hospital, pharmacies, churches, shopping centers and a lakeside marina. Each Spring, visitors come to the Pilgrimage Tours of Historic Homes and to holiday events during the months of November and December. The Aberdeen Visitors Bureau can be reached at 1-800-634-3538 or 662-369-9440.